Commentary: Hey, something new! K-2SO is an Imperial droid reprogrammed as a Rebel droid. I'm assuming this is exposition and not a spoiler. It's cast in black and quite tall - he towers over the other figures in the line so far. 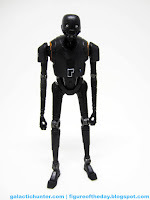 The long arms and legs are connected by ball joints, so you can pop the limbs off if you like. This also limits his movement as the legs can't properly swing forward - they can swivel out a bit, though, so that's better than nothing and it helps adjust his center of gravity if you decide to give him his grapple accessory. He only has 6 joints - 2 at the neck - but he makes up for it with pretty good deco. Scraped-up silver knees and elbows are matched with appropriately worn Imperial symbols on his shoulders, plus little silver highlights with detail around the fax joints, eyes, mouth, and wires. 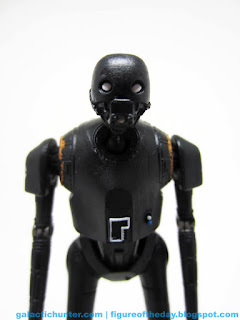 There are even orangey/rusty rings around the hips and shoulders that seem close to the color of some existing Imperial Astromechs stationed on the second Death Star. The proportions seem very new school, but other than that the visual language seems pretty close to being similar to the original trilogy. I could see this guy banged up and rusted out, serving some limited function in Jabba's Palace. The reverse side of the figure is interesting, in both good and bad ways. He has two little antenna that come pre-bent thanks to the packaging, but he also oddly sports the classic Stormtrooper design "OII" on his upper back. Why? No idea! Maybe it means something, and some day maybe someone will tell us. Maybe it's an oversight. The back of the figure is almost completely undecorated save for some spillover of the joints we discussed above - there are no special lights or symbols or buttons painted here. His accessory is a "zipline" - a claw on an arm-mounted gadget that extends a rope out a few inches and he can zip up it, if he holds on. I wish it was a backpack. It looks OK, but if you lost it you probably won't miss it. It's fun enough, but safety prevents us from getting long strings so figures can really go places. It's only slightly longer than my water glass. Unless you've got an allergy to the new movie, this is an awesome looking new droid and a worthwhile addition to your Imperial stash. 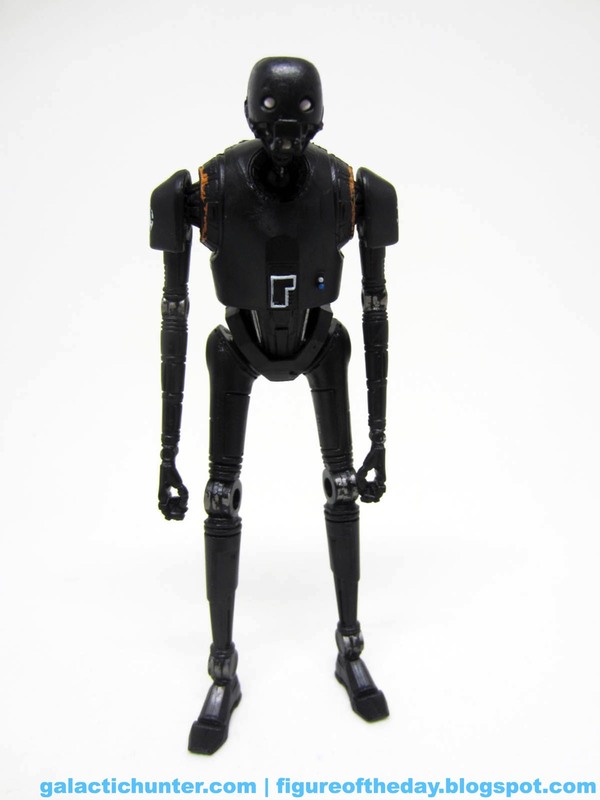 Even if the movie is weak, I assume this droid will still be welcomed by Imperial army collectors as one more addition to shelves or dioramas. It looks good, it's real big, and I don't have a lot quite like it. 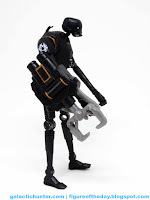 So, I approve - I know we all wish it were super-articulated, but given the history of Battle Droids maybe it'll be more sturdy as a limited articulation release. We'll see how the 6-inch one plays out. The new Empire figure designs seem pretty strong so far, so go ahead and get them. Just don't expect this one to stay standing for long - its weighty torso makes it easy to accidentally knock down. 6 inch doesnt come with Blaster, mocks up did, final product didnt.